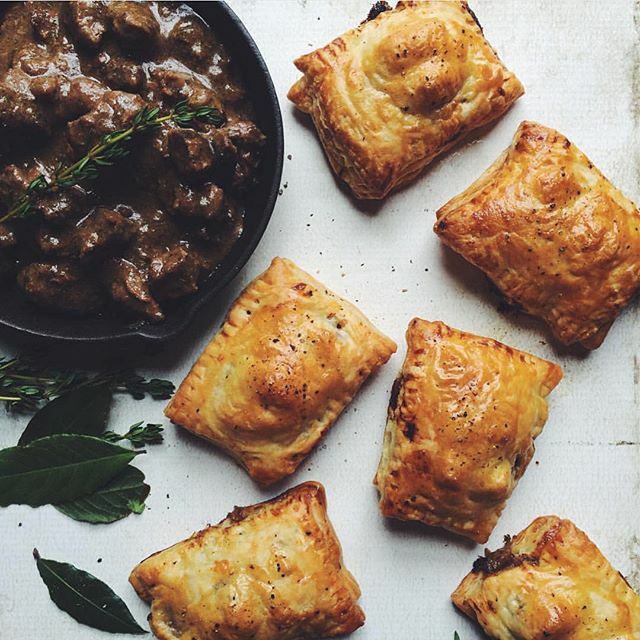 South African Pepper Steak Pies. Comfort food to the max. Slow-cooked South African pepper steak gets wrapped in buttery, flakey puff pastry for the most amazing dinner recipe. Want to make the whole thing from scratch? Check out the recipes for homemade puff pastry in the Laminated Dough feed! Preheat oven to 350F. Toss meat in seasoned flour and brown with onion in hot oil. Deglaze your pan with brandy. Add the beer, water, stock powder, pepper, and thyme. Cover and bake for 45 minutes or until meat is tender. Remove from oven and cool slightly. Increase oven to 400F. Lay 2 pastry sheets flat and cut evenly sized rectangles. I got 12 rectangles per sheet, and there are 2 sheets in a package. 24 rectangles = 12 pies. Cover a large baking sheet with baking paper and place 12 rectangles on it. Add a good amount of filling to each and cover with the remaining puff pastry. I didn’t roll the pastry out, but you might have to stretch the ones that’ll go on top a bit to accommodate the filling. Use a fork to crimp the edges. Beat an egg and brush on top of pies. Bake for 20-25 minutes. Serve immediately! *** You could also just add all of the filling ingredients to a slow cooker and forget about it until the meat is tender. Just add an extra cup of water.